Today is the day. 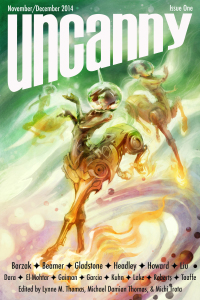 Uncanny Magazine Issue 1 is now available to everybody at unannymagazine.com or at online eBook retailers! Please spread the word! Episode 1: Editors’ Introduction, Maria Dahvana Headley’s “If You Were a Tiger, I’d Have to Wear White” and Amal El-Mohtar’s poem “The New Ways” (both read by Amal), and an interview with Maria conducted by Deborah Stanish. The entire issue can be purchased as an eBook at Amazon, Kobo, and Weightless Books (our preferred retailer). Weightless Books is also offering yearly subscriptions. The rest of the free online content will be available on December 2nd. Thank you again for all of your support and generosity. You made this possible. This entry was posted in Editing, shameless promotion, Uncanny and tagged editing, Shameless Promotion, Uncanny. Bookmark the permalink.